Both the US National Oceanic and Atmospheric Administration (NOAA) and The National Aeronautics and Space Administration (NASA) released reports this week naming 2014 as the world’s warmest year. According to the NOAA report, the average temperature was up 1.24 degrees Fahrenheit over the 20th century average across all land and ocean surfaces. NASA’s Gavin Schmidt said that greenhouse gases are responsible for the long-term warming trends, and that even if the entire world stopped emitting greenhouse gases tomorrow, it still would take many years to stall the rising temperatures. But we better get on it soon! 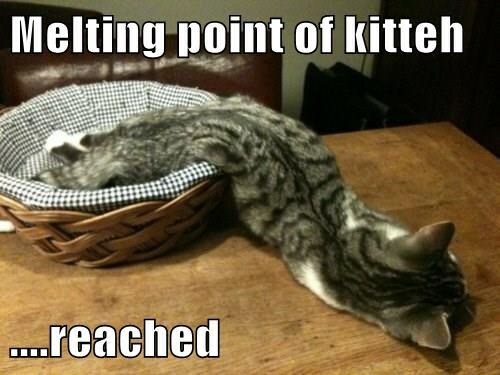 It looks as though some kittehs are already beginning to melt. This entry was posted in Science Caturday, Uncategorized and tagged climate change cat, global warming cat, melting cat, science lolcat. Bookmark the permalink.